One of the worlds largest and most important Breast Cancer Conferences is held yearly in the month of March in Miami, Florida. The Miami Breast Cancer Conference (MBCC) is a conference whereby breast surgeons from over 20 countries gather and spend a number of days discussing and learning about the most recent developments and advances in the treatment of not only breast cancer, but benign breast disease. 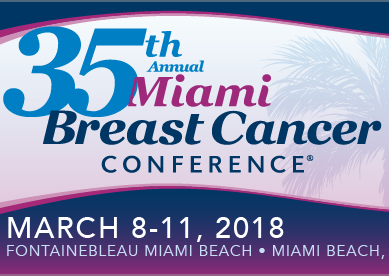 Dr. Lygas attends the Miami breast cancer conference yearly to stay abreast of the most recent developments in the detection of breast cancer and breast cancer disease treatments. This year was no exception, this year at the Miami Breast Cancer Conference other topics were introduced such as the new panel testing for breast cancer and developments in that area as well as some of the newer drugs and treatments available for breast cancer. An exciting new area of pain free breast cancer surgery was introduced and the methods of how to go about this were also discussed and presented. The format of this conference allows breast surgeons from around the world to sit and discuss their cases and experiences in addition to attending formal lectures. By discussing with doctors from Europe, Central and South America, the Caribbean and Canada as well as other Pacific Rim countries one gets better insight into the treatments of breast cancer and breast diseases around the world. This past year Dr. Lygas, as he does on a yearly basis, attended the Miami Breast Cancer Conference and found the information supplied will keep him on the cutting edge of breast cancer and breast disease treatments. Stay tuned for further blogs such as the new panel testing for breast cancer, new drugs and treatments for breast cancer, pain free surgery for breast cancer (yes that’s right) as well as innovative ways to simply treat benign breast disease that is non-cancerous. The Miami Breast Cancer Conference over the past 30 years has been the go to conference for the most recent developments in breast cancer and this year was no exception.